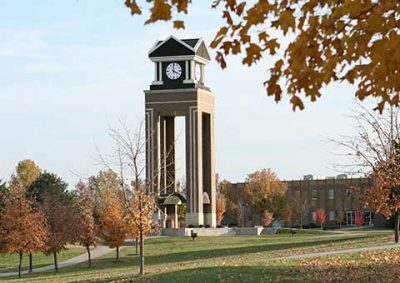 When walking under the Glenn E Marion memorial clock tower, students always walk around the seal. Legend has it if a student steps on the seal, he or she won’t graduate. After commencement, new graduates walk under the clock tower, and over the seal, their first steps as official college graduates. After a Griffon victory, teams and coaches ring in the win. 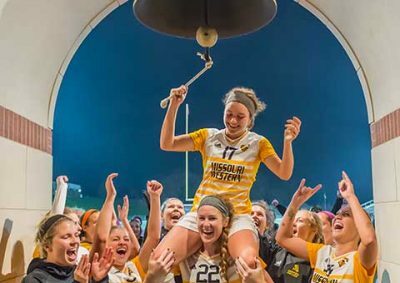 The tradition started with the big bell at Spratt Stadium, but now bells are rung at the Looney Field House and Spring Sports Complex as well. And following commencement, the bell is rung to celebrate the ultimate win for all students: graduation. When prospective students visit campus, they rub the Griffon’s head for luck as they leave for their first campus tour. 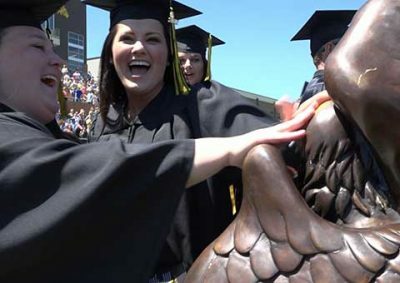 And, at commencement, students leave the University as they came in, rubbing the Griffon’s head one final time for luck as they embark on their next adventure. 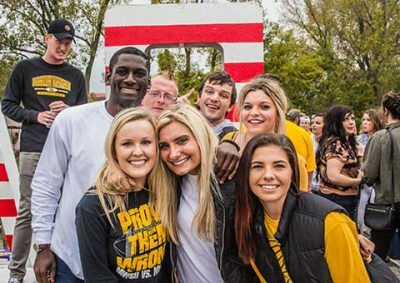 On and off campus, we show our Griffon Pride by wearing Missouri Western’s school colors every Friday. Whether it’s game day or not, celebrate the week’s end by donning your black and gold. We even hold contests throughout the year where you can win prizes for wearing black and gold. 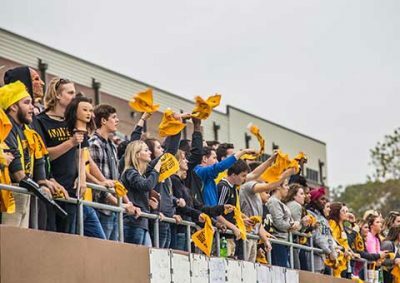 For the full game day experience, you’ll want to join Max’s Maniacs, the official student fan club of Griffon athletics. When you join Max’s Maniacs, you get free Griffon gear and special offers as well as the chance to win prizes – just for attending Griffon sporting events! After every home football victory, teammates, coaches, students and fans used to gather at the Victory Tree to hear a post-game speech from the coach, followed by the Fight Song. 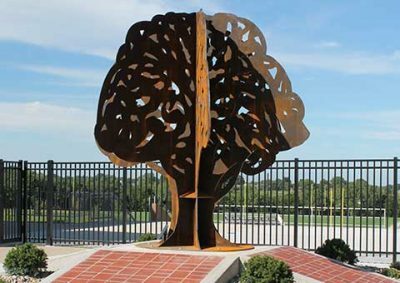 Today, the tree is no more, but Spratt Stadium’s Victory Plaza houses a sculpture, standing tall as a nod to this time-honored tradition. 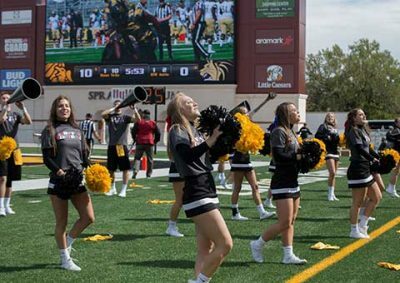 Missouri Western’s original fight song, “Fight On, Griffons,” was written by Carl E. Bolte Jr. in 1979, and is played by the band and sung by the crowds before every home game. Want to learn it? Watch this video and follow the bouncing Griffon to sing along!